My wife and I always bring each other breakfast in bed on our respective birthdays. Her birthday is tomorrow, but I brought her breakfast in bed a week ago to make her think I’d gotten the date wrong. It was probably the first time in a year that I’d successfully played any joke on her because after almost twelve years of marriage, she’s seen my entire playbook, and it takes a lot of effort and planning to get anything past her. And speaking of birthdays, The Good Greatsby will be celebrating its one-year blogaversary next Wednesday, February 22nd. Is anyone thinking of throwing me a party? I’m using the anniversary date as motivation to tidy up the place and introduce some new features and pages that have been written on a piece of paper sitting next to my computer titled: February 23, 2011 Blog-To-Do List. I’ve loved writing this blog and getting a chance to interact with readers every single day. I hope I’m just getting started and have a lot more plays in the playbook. Last year I co-directed, and performed in a play I wrote, A Minor Case of Murder, and my two lead actors were cast in a movie shooting here in Shanghai. Ninety percent of the stress in theater, TV, or movies is scheduling, and this production was no different as I worked around their hectic schedules. I didn’t audition for this film but I did visit the set one evening as an extra so I could rehearse lines for my play with one of my actor’s in between his scenes. Can you spot me or my head three different times in this trailer? Two of the shots are only my head in the background, but one is a clear shot of my face. If you think you can spot me, guess any of the times in the comments section. Shanghai Calling: Starring Daniel Henney, Eliza Coupe, Bill Paxton, and Alan Ruck. More important than spotting me, I hope you enjoy some of the vibrant scenes I see every day here in Shanghai, an amazing city that’s been home for almost eight years and has become my adopted hometown. It’s fun to see the trailer and personally know so many of the actors and the locations. Even though China has 1.3 billion residents, the ex-pat community is small and very well-connected and I know people in dozens of Chinese cities. When the Amazing Race debuted in China, and screened contestants from every major city, my wife and I knew seven of the sixteen contestants: Two were in my dodgeball league, one was the mother of one of the boys I coached in little league baseball, one was a mom who asked my wife’s band to sing at a birthday party, and two were roommates of a co-worker. The guy with the beard speaking at the beginning of the trailer played my murder victim. You might also remember him as the actor my wife gave two compliments for every one compliment she gave me following our joint appearance in Twelfth Night. But still, I can’t resent him too much since he’s the only guy I know besides me who owns a smoking jacket, and even more importantly, is willing to back me up by wearing it out on the town. If you have any questions about me, the blog, my writing, or my gift wish list, and have always wanted a non-satirical answer, please submit them below, and next week I’ll try and either give a serious answer, or pretend the question got lost. If you have any nominations for your favorite post or posts, I’d appreciate your feedback below. I may highlight some of those posts or put the nominees in a poll in the coming week. Back of your head 2:05? I was planning to throw you a party, but now that you mentioned it, it wouldn’t look very spontaneous. I’d still accept an expensive party over a spontaneous one. I know all three, but I feel guilty being the first one to say them. You have the unfair advantage of having seen the side of my head a lot more times. Your big ol’ Asian head. Yep, Asian. Go find him, readers! Any chance that was your face around 1:58 standing outside at a party? Also, I am shocked to hear that this excellent blog has only been around for a year (despite the fact that the archives sit directly to the right of this comment and I could have clearly seen this before). The success of this blog is inspirational, as much as pains me to admit it, and I am somewhat impressed by it…somewhat. Don’t go getting a big head over that last sentence. I have a hard time choosing a favorite post, though I would mention “Checkmate, Kindle!” and “Things I carry in my pocket for the sole purpose of confusing the police in the event of my untimely demise” as a couple of them. Your inclusion in The Huffington Post really solidifies the fact that you have a gift when it comes to this stuff and I harbor extreme jealousy towards you for that. What? Oh, I said that out loud? Umm…I mean congratulations. Yes that’s me at 1:58-1:59. The other two shots of the side of my blurry head aren’t as significant. Thanks for your measured praise which I know must require a lot of energy after your resolution to keep me humble by finding me unimpressive. Were you the old chinese guy on 0.10 seconds holding a chicken (I think)? The city is very clean except during the many, many festivals when fireworks litter every square inch of the sidewalk. Near the beginning, when he learns he’s going to China, and the wall behind him falls down to reveal a verdant country scene and what LOOKS like an old, Chinese man. Great makeup job, Paul. It’s a little creepy that your blog knows all my contact info and somehow dropped it into the above form. If you were truly Big Brother it would have filled in the question as well. Not me, although I would have been willing to audtion for that part. It fills in my contact information as well. Strange. Did someone say party? I’ll bring the chip and dip. And balloons. I think we need balloons. And a clown. Yeah, we need a clown. And goodie bags. Definitely. And cake. A really big cake. With sparklers. Yeah, sparklers. And maybe drinks. Maybe lots of drinks. I guess if we have drinks, we really don’t need cake. But where would we put the sparklers? In the drinks? Sure, it’s always fun until someone loses an eye. Congrats and Happy Anniversary…I feel lucky to have found you! (And the people who comment regularly are pretty funny too.) I’m with sportsjim81 on the “Things I carry in my pocket…..in the event of my demise” post. That was a laugh out loud one. The commenters are pretty incredible, or at least the commenters I allow through moderation are. That sounds like a blog post right there. you look so spiffy in your non-smoking smoking jacket, definitely ready for a night in the town, aren’t you? were you that person sitting beside the lead in 2:11. If so I just want to compliment you on your shoulders. You have the perfect shoulders to showcase a strapless dress. Wasn’t me, but I think I could have pulled that role off. I already bought the celebratory pinata. It’s shaped like Obama’s head and full of Laffy Taffy! Yep, 1:59, standing at the party holding a drink. You might want to double check that your blog ‘to-do’ list is still there. I may or may not have stolen it. Are you the one who keeps placing coffee mugs and pipes on top of it so I keep forgetting it’s there? Nice try but I think I would remember buying six pipes, Darla. I had a team of engineers consider multiple techniques that might allow me to smoke as many pipes at once as possible, but we never made it past four at a time. Dammit! Four! I knew it! Gah! Wow! I just saw your head in a movie trailer. How cool is that! I think you were outside in the dark on the left hands side of the stars. Not that you aren’t a star….and on the TV on the right. Congratulations on your Blogaversary and wish your wife a happy birthday! Over 200,000 views is amazing for one year! One of my favorite posts is Weekend Silent Sampler. The Fonz stole the show with his own version of the “vow of silence.” I think we could be seeing him in a movie trailer in a few years.. I hope The Fonz will grace us with many more vows of silence. I sent you a message, but meant to send it as a comment. Early morning computer confusion- forgive me. I will repeat my comment here! 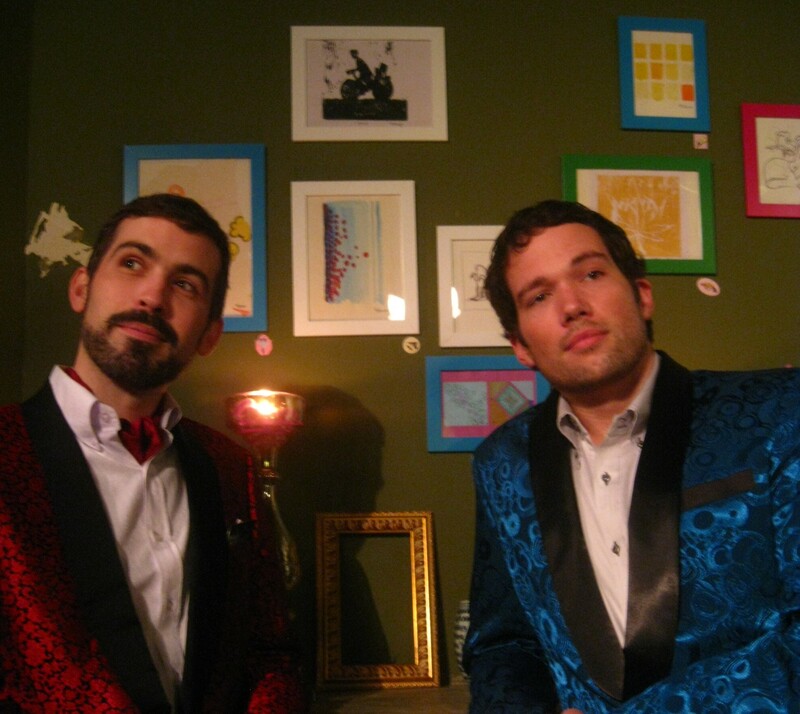 If I were to make you a smoking jacket, what would be your dimensions? Can you get me Cameron’s autograph? I loved him in Ferris Bueller! And if there ain’t no party like a west coast party cuz a west coast party don’t stop- do you think your party will be as good? I have a tailor with all my dimensions so I’d have to ask him, but I hope he wouldn’t suspect it was so someone else could make me a smoking jacket. I don’t know what I’d do if he cut me off. I didn’t get a chance to meet Ferris Bueller’s best friend or get his autograph but if he comes here for the premiere I’ll see what I can do. I couldn’t spot you – sorry. But the trailer makes me want to see the movie, and also, possibly visit Shanghai. Congratulations on your blogaversary. I always enjoy reading your blog, so keep it up! If you only have time for a short trip you should consider Hong Kong before Shanghai. Hong Kong might be the greatest city in the world. I really love the community in Shanghai though. Yup, that’s me. I couldn’t get myself to wave at myself either. Happy birthday to Mrs. Greatsby tomorrow! And a very happy blog-o-versary as well! I try to make every month as impressive as possible but it’s true I’m trying a little harder for this one. Once you spot my head, you’ll realize how my noggin brings the whole movie together. I’m planning on throwing your blog a birthday party…as long as it’s okay with you if only 3 people show up. And we wear paper hats. And you’re not invited. I’m assuming all of that’s cool with you. Can you at least send me a picture of you and all your guests wearing smoking jackets? I’m not even going to try to spot you in the trailer because I’m really bad at that kind of thing — so bad, in fact, that I wasn’t 100% sure that the guy with the beard in the photo wasn’t also you. I can understand the confusion since all men in smoking jackets look the same. Yep, I saw you at 1:58 too. How cool is that? So excited for you and your fam! Happy B-day to the Mrs. I would love to see this movie the trailer was very good. I have no idea whether the movie will be good or not, but the trailer seemed alright, although I don’t necessarily love trailers that reveal the entire plot from beginning to end. Doesn’t this guy look and sound like Bobby Moynahan from Saturday Night Live? Oh, you’re right. Makes you wonder if this guy was Moynahans primal influence? eek. Of all the Aquarians I’ve been married to, she’s certainly my favorite. okay, we all know you are wonderful and all but how about that wife of yours? She’s a hot librarian and didn’t you say once she was studying for another degree? And now you mention she has a band? She’s awesome! Happy Birthday to the awesome Mrs! She’ll finish her Masters in May and after that I hope she’ll be able to dedicate more time to awesomeness. You have almost 203,000 clicks before your 1 year anniversary. I am trending toward 5000 on mine. This would be why YOU are my blog mentor! But at least 198,000 of those clicks came from my personal assistant Ken. He says supporting my personal blog isn’t in his job description, but how would he even know this since I’ve never allowed him to see his job description. 1:27? 1:49? I don’t know. I don’t like to scan back. It looks like a good movie though. I am sure your play will also be outstanding. I have only read two of your posts here so nominating my favorites seems a little inane, but they were BOTH entertaining. On a tangentially related issue, I did share your “cat breading meme” from Huffington Post on twitter. Based on your above comment, i am totally getting a personal assistant to click the heck out of my blog. The question is who will CATCH the party. Parties are heavy, you know. I read this post earlier today (er, while I may or may not have been ‘on the clock’…) and I have way too much to say about it. Hypothetically, if I send you 79 questions…would you be willing to answer at least 16? P.S. – Hot Librarian sings, too? J.H.C. Who are you people??? – and more cow bell. You’re not the guy behind the wall in 0:10 are you? Because if so, you might want to think about using sunscreen… I’ll throw you a party! We can have cyber tacos and cyber sushi and other cyber food that I get to pick only because I’m a really picky cyber eater. I don’t think there’s any doubt about which post is your all-time best; I’m sure everyone will agree that it’s your April 10, 2011 piece, “Laura Wins Caption Contest: Awarded Life of the Party Status for Coming Week”. For one of the fabulous prizes, you promised you’d leave a flattering comment on my blog every day that week — and then you actually did. That’s a much higher level of customer service than one usually expects to find in blogs these days. 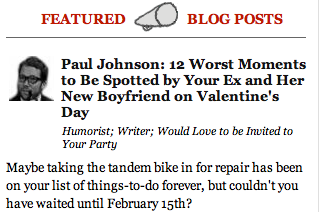 I almost said that one of my favorites was your Valentine’s Day post from last year, but then I realized that would be a horrible insult, because you weren’t blogging last Valentine’s Day. The one I was thinking of is “Unromantic Gestures”. Another favorite is “Things I Carry in My Pocket for the Sole Purpose of Confusing the Police in the Event of My Untimely Demise”. I also liked the Dear Good Greatsby series. Are you planning on starting that up again? I’d ask whether you ever got any questions that you felt you couldn’t answer, but I wouldn’t want to pressure you into breaking the sacred seal of advice columnist confidentiality. First of all, I can’t believe it’s only been a year! The way you blog, and with your following, I would’ve figured at least two years. Second, why China? Why did you become an expat? I’ve always wondered, so perhaps you can explain in a future blog. Can I assume you speak the language? Is there anything you miss from the states besides Girl Scout cookies? Wow, you live in China! That is too cool. Sounds like you have a fun and interesting life!